The poetic world of the Song of Songs is a famously heady and distortive landscape, filled with bright sunlit rills, nocturnal cityscapes, and fecund bodies laid out like kingdoms. But what does the Song’s use and abuse of spatial relationships tell us about its subject matter, and what do its strange panoramas tell us about literary space more broadly? Directly challenging recent methodological trends in biblical spatial studies, Journeys in the Songscape uses a range of innovative critical tools to explore, map and critique poetic space in the Song of Songs. Taking the reader on a series of journeys across the Song’s gendered, rural, urban and bodily spaces, Meredith argues that the worlds that spring up between the Song’s lovers are all subtle reimaginings of the space between the biblical page and its own readers, and that at the heart of the Song is a (con)fusion of the dynamics of loving with the experience of reading. Love is at work in the Song, says Meredith, but it is not its subject so much as a sign under which collusions of power, textuality, space and subjectivity labour. The Song’s world speaks not only to sexual relationships, then, but to the structure of language itself; textual spaces do not organize textual meaning but rather image its fundamental instability. 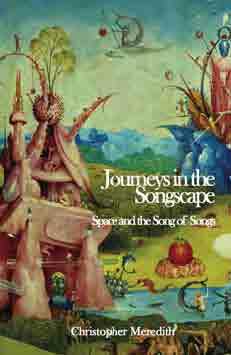 Journeys in the Songscape is a bold new literary treatment of the Song of Songs, but it is also a rethinking of what we mean by the term ‘literary space’, and represents a playful incitement to reconsider how critical tools are put to use in apprehending space as a literary construct. Chris Meredith is Teaching Fellow in Hebrew Bible, Department of Biblical Studies, University of Sheffield. On the Scrim: Fluid Continuity in the Song?